This week, Firefox 8 was released. Six weeks earlier, Firefox 7 was finalized. And six weeks before that, Firefox 6. Any doubt that we'll see Firefox 9 six weeks from now? I remember when version numbers meant something. When the Mac went from System 6 to System 7, there were some real changes - multitasking was no longer optional, a new 32-bit mode was added, balloon help was just a mouse click away, and those ever-so-useful aliases were introduced. System 7.1 streamlined the System Folder by moving Fonts into their own folders. System 7.5 gave us desktop printing, Extensions Manager, WindowShade, and a menubar clock, along with a hierarchical Apple Menu. Mac OS 8 brought us spring-loaded folders, contextual menus, and a multithreaded Finder. OS 8.1 gave us a new, more space-efficient file system, HFS+, along with support for volumes larger than 4 GB. And Mac OS 9, specifically designed for compatibility with Mac OS X. Likewise, each major revision of OS X has brought significant change as well. The same could be said of Unix, Apple DOS, CP/M, MS-DOS, Windows, iOS, and Linux, not to mention word processing, spreadsheet, database, image processing, and other types of software. 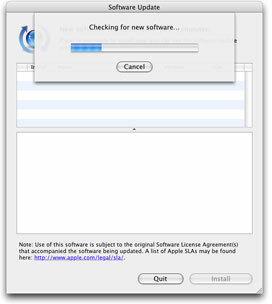 A change in version number meant some significant changes in the software. It used to be true of browsers as well. As the Netscape browser progressed from version 1.0 to 2.0 to 3.0 to 4.0, lots of things changed. As Internet Explorer continued its march from version 1.0 through today's 9.0 and tomorrow's version 10, there are significant changes at each stop along the path. Ditto for Apple's Safari browser, good old Opera, and OmniWeb, a browser first developed for NeXTstep and since ported to Mac OS X.
Firefox began at version 1.0 in November 2004, reached version 2.0 in October 2006, hit the 3.0 mark in June 2008, and didn't make it to version 4.0 until March 2011. Those numbers represented significant milestones in the evolution of the browser - but that's no longer true with Mozilla's rapid release program. We got Firefox 5 on June 21, 2011, Firefox 6 on August 16, Firefox 7 on September 27, and Firefox 8 on November 8. And Firefox 9 is already available for testing. What significant changes did these versions bring? 4.0: New user interface, faster page rendering, and a bookmark sync manager. 5.0: First rapid release. Wikipedia doesn't note any significant change from 4.0. 6.0: Permissions manager, quicker startup. 8.0: Third-party add-ons disabled by default. In the old days, version 5.0 would have been 4.0.something or 4.1, and 7.0 might have been worthy of a full version number upgrade thanks to improved memory management, a longtime issue with Firefox. Instead, we get whole version number changes with relatively minor software changes. Special note to PowerPC Mac users: TenFourFox 8, a version of Firefox 8 optimized for G3, G4, and G5 Macs running OS X 10.4 Tiger or 10.5 Leopard is already available, so you don't have to feel left behind. And with Adobe's announcement that it is halting development of Flash for mobile platforms, having an up-to-date browser with great HTML5 support will be more important than ever going forward. Why? Because that's the way Google does things, and Google's Chrome browser, launched in September 2008 and now Firefox's primary competitor for the #2 browser spot behind Internet Explorer, has a rapid release cycle. Chrome has been available for Windows, Linux, and Intel-based Macs since version 5 was released in May 2010, and it's already up to version 15. That's almost five whole number revisions per year, and I guess Firefox just wants to catch up with Chrome's number. I think part of this is psychological. For quite a while, we had version number parity between Netscape and Internet Explorer, so whoever had the highest revision number seemed to be ahead of the game. But that hasn't been the case since Nescape threw in the towel and created the open source Mozilla project. Today's current browser versions are Safari 5.1, OmniWeb 5.1.1, Firefox 8, Internet Explorer 9, Opera 11.52, and Chrome 15. The revision numbers have no bearing whatsoever on those of competing browsers. There are two real problems here. The first is that the development cycle is so short that users tire of installing updates every two months or so. The second is that casual users - who are really more likely to use the default Internet Explorer or Safari browsers - are unlikely to even look for updated versions of their apps. For instance, our site logs show that 53% of those using Internet Explorer are on version 8, 28% on 9, 14% still on 7, and 4% are using still older versions. Among Safari users, almost everyone is using Safari 5.something. Firefox: 57% using version 7, 17% still with 3.6, 7.8% on 6, 1, 7% on 4, 3.3% on 5, and already 2.2% on brand new 8. Chrome is even messier: 57% are using 14 (Sept. 9, 2011), 34.5% are using current 15 (Oct. 18), 1.5% are trying 16, and about 1% each are 12 (June 7, 2011) and 13 (August 2). With rapid release, version numbers end up becoming meaningless, just a blur of numbers, no longer signifying the anything important has taken place. Still, it is nice to know that you are running the latest version of your favorite and crucial apps. The problem is one that has plagued users for decades - software updates. Apple has built Software Update into the Mac OS for ages, but in the old days you had to manually launch it, and even if it pops up every week or month, many casual users are going to ignore it. The same goes for iOS, where you have to launch the App Store program if you want to be notified about software updates. It's wonderful that most browsers can check at startup and tell you if there's a new version you should update to - although that can have its drawbacks as well, such as prompting you to update to a new version of an app that may not be compatible with your older hardware or operating system. Still, it's a big step in the right direction. What we really need is for every app and every operating system to perform startup checks as well as daily or weekly checks for updates, since some computers and devices are rarely shut down or restarted. The notifications should be meaningful - much more than "a security update" or "improved stability" to grab the user's attention. Something like, "This update to Firefox block an exploit that lets others remotely control your computer. Updating is strongly recommended." And then the update process has to be simple. Not like the iOS 5 update. I've had more people complain about losing their installed apps or their photos while upgrading to iOS 5. It's got to be smarter on the computer side because most users are not savvy computer geeks. It's got to be bulletproof, so you don't end up with a bricked iPhone or Mac. If would be even nicer if there were a simple way to revert to the previous version if the new one introduces new problems. For Mac users, there's Time Machine, but even when you provide such a simple solution, you have to convince people that there's a legitimate reason to invest in a backup drive or Time Capsule - and you have to make it easier to tell your Mac or iPhone you want to revert to the last version of iPhoto or the Yahoo! app. Every app should be written so it can download and install its replacement, then quit itself and launch its replacement. Anything less is more than the casual user wants to deal with. Make it easy. Make it friendly. Give users a reason to want to wait for the update to load and the software to relaunch itself. When that's possible, I won't have to keep multiple downloaded zipped versions of Firefox, SpamSieve, and other apps on my Mac's main drive, and version numbers will become even less important - you'll only want to know if you have the most recent version your computer, smartphone, or tablet support. Of course, I'll still make sure I have a bootable backup drive in addition to anything backed up by Time Machine, because you just never know when a drive may fail. But that's another issue.